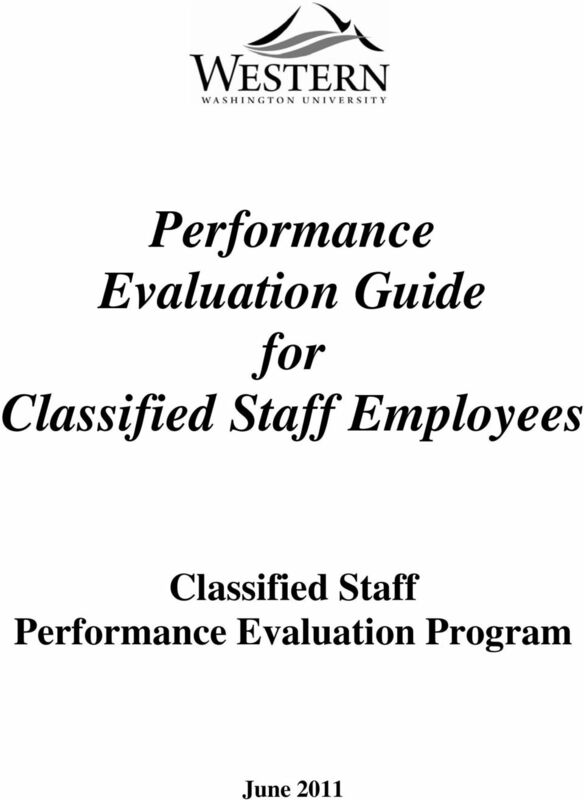 Download "Performance Evaluation Guide for Classified Staff Employees. 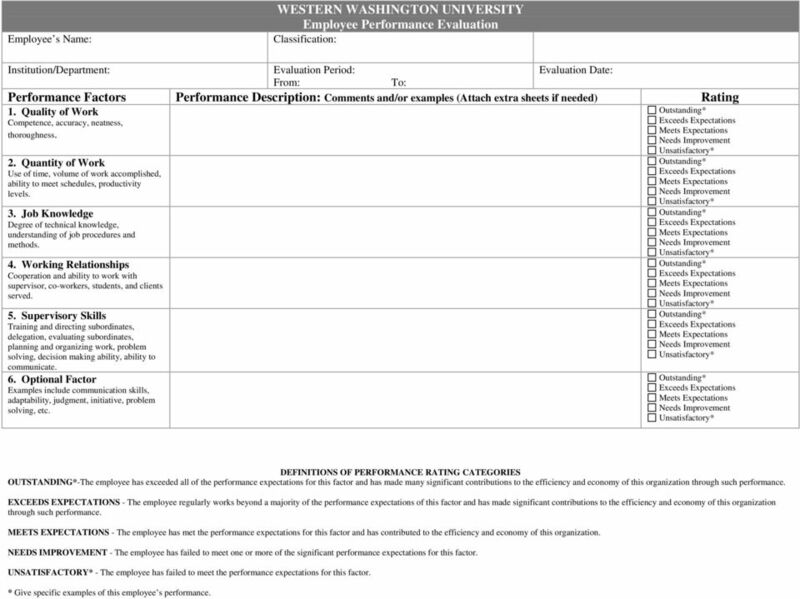 Classified Staff Performance Evaluation Program"
6 WESTERN WASHINGTON UNIVERSITY Employee Performance Evaluation Employee s Name: Classification: Institution/Department: Evaluation Period: Evaluation Date: From: To: Performance Factors Performance Description: Comments and/or examples (Attach extra sheets if needed) Rating 1. Quality of Work Competence, accuracy, neatness, thoroughness. 2. Quantity of Work Use of time, volume of work accomplished, ability to meet schedules, productivity levels. 3. Job Knowledge Degree of technical knowledge, understanding of job procedures and methods. 4. Working Relationships Cooperation and ability to work with supervisor, co-workers, students, and clients served. 5. Supervisory Skills Training and directing subordinates, delegation, evaluating subordinates, planning and organizing work, problem solving, decision making ability, ability to communicate. 6. Optional Factor Examples include communication skills, adaptability, judgment, initiative, problem solving, etc. DEFINITIONS OF PERFORMANCE RATING CATEGORIES OUTSTANDING*-The employee has exceeded all of the performance expectations for this factor and has made many significant contributions to the efficiency and economy of this organization through such performance. EXCEEDS EXPECTATIONS - The employee regularly works beyond a majority of the performance expectations of this factor and has made significant contributions to the efficiency and economy of this organization through such performance. MEETS EXPECTATIONS - The employee has met the performance expectations for this factor and has contributed to the efficiency and economy of this organization. NEEDS IMPROVEMENT - The employee has failed to meet one or more of the significant performance expectations for this factor. UNSATISFACTORY* - The employee has failed to meet the performance expectations for this factor. * Give specific examples of this employee s performance. 7 7. Specific Achievements (Use additional sheets if necessary) 8. 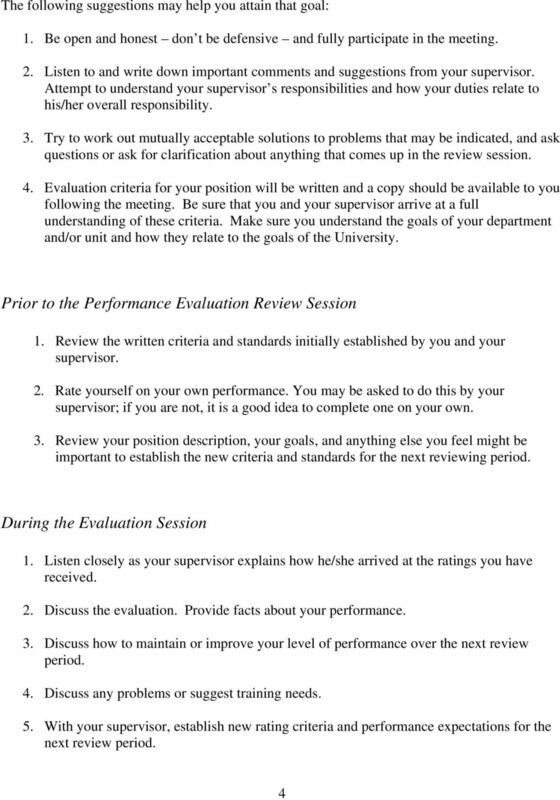 Performance Goals for the Next Evaluation Period 9. Training and Development Suggestions 10. 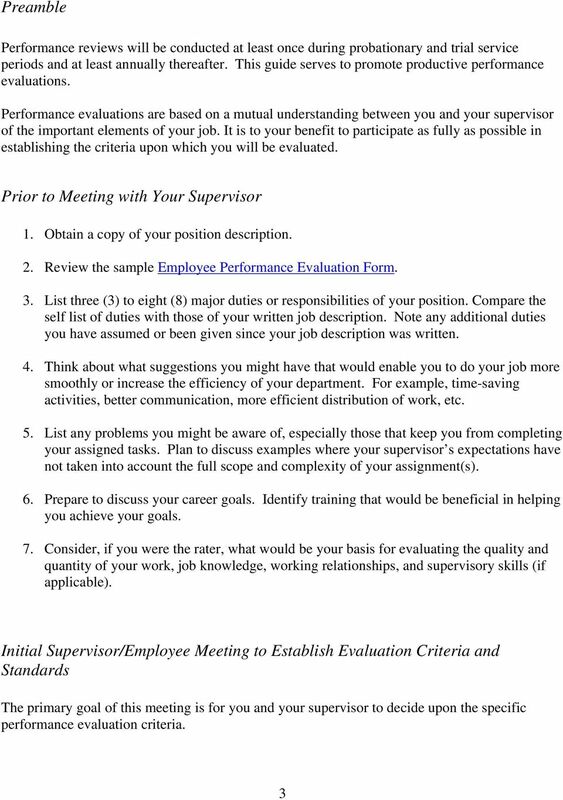 Attendance (Supervisor s Comments) Supervisor s Name (Print or Type) Title Signature* Date Rated Employee s Comments This performance evaluation was discussed with me on the date noted above. I understand that my signature attests only that a personal review session was held with me; it does not necessarily indicate that I agree with the evaluation. 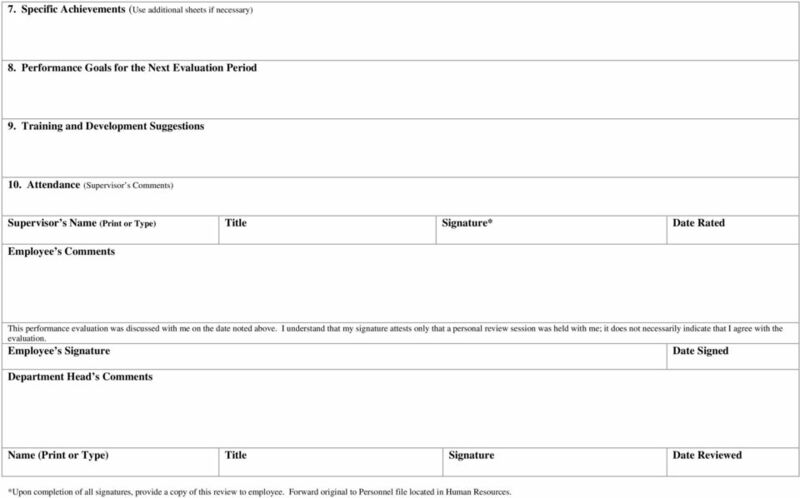 Employee s Signature Date Signed Department Head s Comments Name (Print or Type) Title Signature Date Reviewed *Upon completion of all signatures, provide a copy of this review to employee. Forward original to Personnel file located in Human Resources. 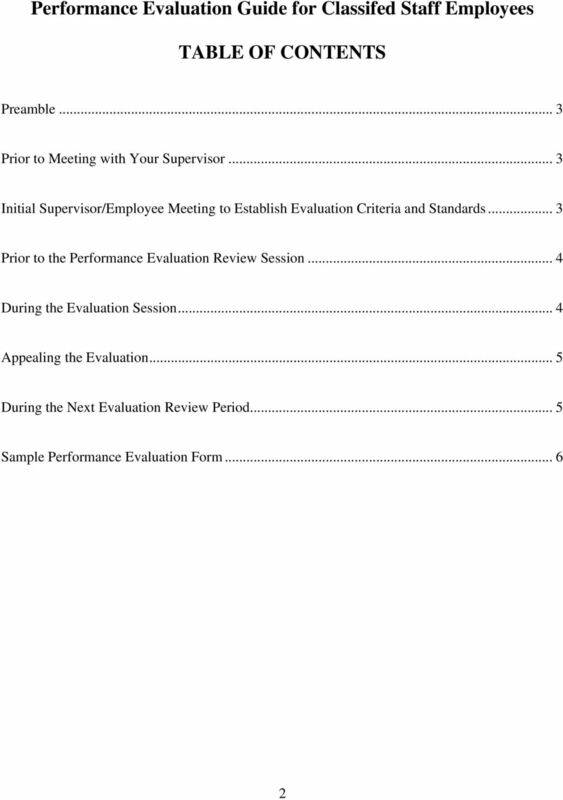 The information contained in this guideline is the processes typically recommended by Human Resource Services (HRS). 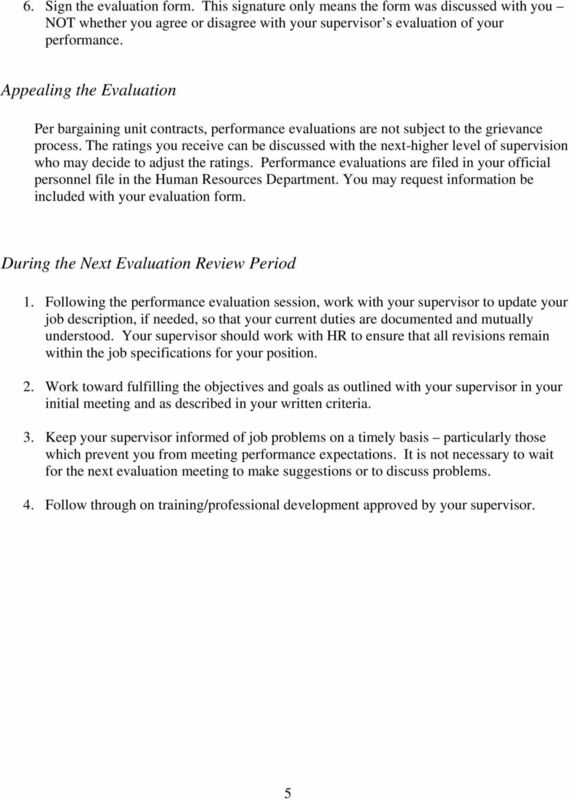 PURPOSE: To establish standardized procedures for preparing and processing employee performance evaluations. Performance standards and expectations, based on an up-to-date position description, should be clearly communicated to employees at the time of appointment to their position and as they change thereafter.